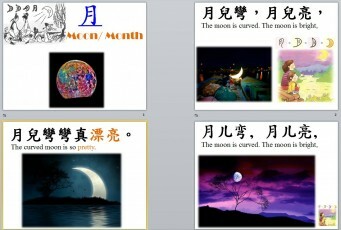 月兒彎，月兒亮，The moon is curved. The moon is bright. 月兒彎彎真漂亮。The curved moon is so pretty. 祝你生日快樂 Happy birthday to you! 一二三木頭人。 One, two three, Wood Man. 不要跑，不要動。 Don’t run! Don’t move! 不要插隊！ 不要爭吵！ Don’t cut in! Don’t fight!